This gift box has a net weight of 12oz. Fresh Butter is simmered with Roasted Almonds to Create a Mouth Watering Toffee, we then dip it into a rich Milk Chocolate and Top it With More Roasted & Chopped Almonds. 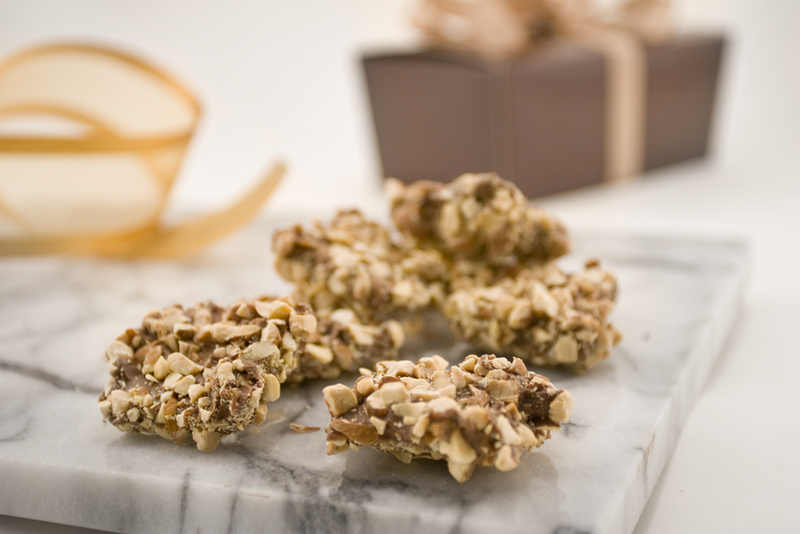 Our Old Fashioned Almond Butter Crunch is truly unique and absolutely Irresistible! Superior Nut Company - Almond Butter Crunch - Net Wt. 12oz. Ingredients: Sugar, Almonds, Salted Butter (Milk), corn Syrup, Cocoa Butter, Milk, Chocolate Liquor (Processed with Alkali), Salt, Sodium Bicarbonate (Leavening), Soya Lecithin (an Emulsifier), Vanilin (an Artificial Flavor). Excellent product. I use your company to send gifts and I get raves from the recipients. Almond Crunch was a loved by my mother for motherâ€™s day. Thank you. Best almond crunch I have ever tasted. Bought a whole bunch for friends and family members. Everybody loves it. Nice packaging too! Simply delicious...a wonderful treat for the holidays!